SG-1 receives word that the System Lord Ares has fled Ba'al's forces and plans to reclaim a planet in his former domain as a refuge. However, the planet is now home to Harry Maybourne, and O'Neill sends SG-1 to fetch Maybourne before Ares arrives. 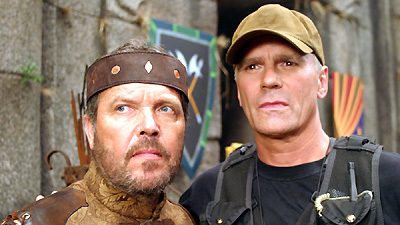 On the planet, however, SG-1 discovers that the simple people know Maybourne as King Arkhan, a prophet and beloved leader. King Arkhan has foretold the arrival of the enemy as well as the offworlders who will save their planet, and Maybourne later confesses to SG-1 that his prophecies come from temple ruins with Ancient writings that reveal events that have yet to happen. The temple writings reveal that an Ancient had once used a ship to travel through time, and a search of the area uncovers a small spacecraft containing a time travel device. The ship can only be operated by someone who possesses the Ancient gene, and O'Neill arrives through the gate, hoping to recover the technology. Carter attempts to make the ship flight worthy as O'Neill and Maybourne unsuccessfully attempt to convince the people to abandon their world. Time is running out, however, and as Ares's mothership appears in orbit, his Jaffa and First Prime, Trelak, arrive through the stargate to conquer the planet. Trelak and his Jaffa take control of the village and investigate the area around the Ancient temple. Carter completes the repairs to the ship just as they are discovered and are fired upon, while in the village, Teal'c, Daniel, and Maybourne battle the Jaffa, and Trelak faces death at the hands of Teal'c. Through the power of his mind, O'Neill pilots the Ancient ship into orbit and destroys the mothership with a well placed shot. The prophecy has come true, and the offworlders have defeated the enemy of old. SG-1 prepares to depart, but Maybourne has chosen to remain, unwilling to abandon his new home, his people, and his wives. The war between Ba’al and the System Lords has reached a critical stage. According to Tok’ra intelligence, Bastet and Olokun are dead, Morrigan has capitulated, and Lord Yu and Amaterasu are rallying their armies for what will probably be their last stand. In the face of imminent defeat, some of the System Lords are actively seeking out areas of refuge, and planets they abandoned long ago are now being scouted as possible sanctuaries. Two years ago, the Tok’ra dropped Maybourne off on a simple planet that used to fall under the domain of Ares until the naquadah mines were depleted. Now Ares is returning to reclaim his abandoned world. The Ancient spacecraft and time device are the first evidence that the Ancients mastered time travel. The script on the temple pillars is a historical log compiled by an Ancient who traveled through time to study the evolution of life on the planet. The writings are a couple hundred years old, indicating that he traveled to the future, then back to a time a few hundred years earlier and left the written record. Maybourne has picked up a decent understanding of Ancient writing. By interpreting the writings, he became known as King Arkhan the First, a prophet and seer. Maybourne had also brought to the world the design for the new water mill, new medicines, a legal code, and an irrigation system. O’Neill is able to operate Ancient technology because he possesses the Ancient gene. He is able to fly the Ancient spacecraft (known as a puddle jumper in Atlantis). Ojen fruit is sort of a cross between a guava and a mango. No phones, no lights, no motor cars.